You’re invited to a wedding and you would like to give something unique, special and personalized? 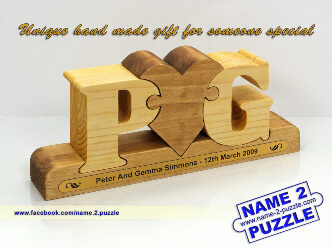 Why not choose our stunning personalised wedding initials gifts that are really special for the bride and groom. This would make an ideal wedding or wedding anniversary gift! It is 100% hand made from one piece of solid pine wood, sanded and finished with olive oil. This is a perfect, unique and original gift that would always remind the date of the wedding to the family members. The date of the marriage would never be forgotten! It is a unique gift with the letter(s) of the bride and the groom joined by a heart – the symbol of love. You have the choice of combining the initials to two swans that meet the center – a beautifully shaped heart! 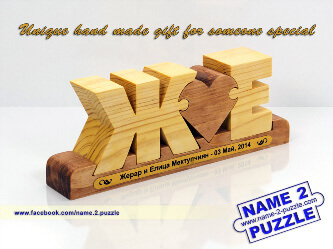 The personalized wooden wedding name puzzles with swans and 2 letters (initials) on a base and laser engraved gold plated metal strip (with the names of the couple and the date of marriage) are a great gift idea for the marrying couple, handmade especially for them. 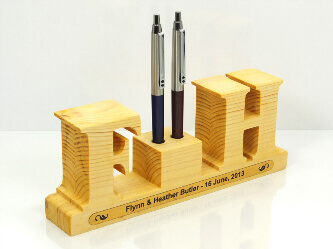 Our wedding initials gifts and wedding pen holders are a perfect gift for weddings, engagements and anniversaries, or to celebrate your own relationship. 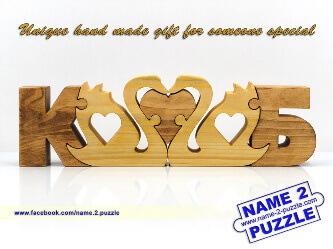 Each puzzle is unique and would make an adorable wedding gift. The personalized wedding initials gifts can be displayed at the wedding reception and then used as home décor as a reminder of the Big Day. This is a gift that will be treasured forever! NOTE: We do not have ready to buy wedding initials gifts. We make them only by order. Dimensions: 22 x 8.5 x 4 cm. Dimensions: 21 x 8.5 x 4 cm.